Located on the East Coast of Peninsular Malaysia between Kuala Terengganu and Kuantan, the Tanjong Jara Resort is built on a 17-hectare site facing the South China Sea. 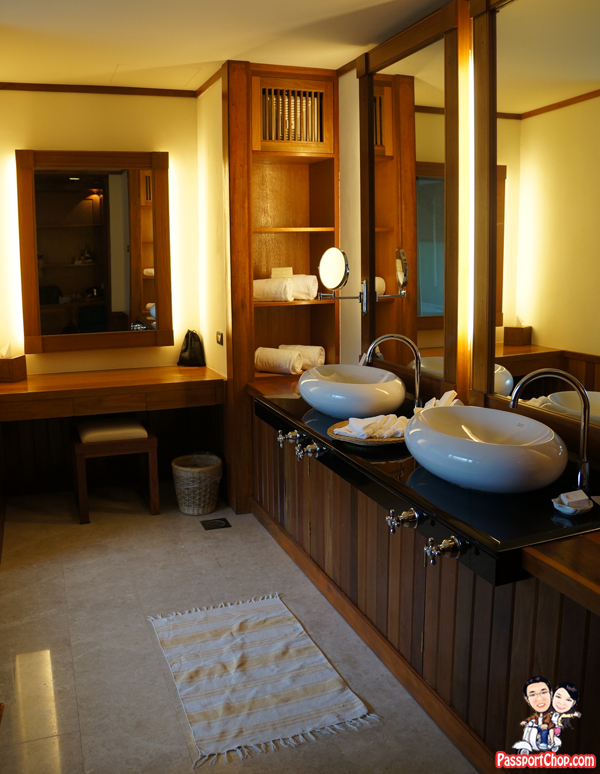 The resort is luxurious yet also every part of the resort from its architecture to spa services are steeped in age-old Malay traditions. The latter part is what distinguishes Tanjong Jara Resort from other luxurious resort in Malaysia where you can experience the gentle Malay art of service and hospitality as well as Terengganu culture through the resort’s weekly Kampung Life. The tagline of Tanjong Jara Resort is “Unmistakably Malay” and walking around the resort, you can’t help by feel that you are experiencing the grandeur of a 17th century Malay palace with its beautiful park, green lawns and majestic wooden houses with their distinctive Rumah Melayu architecture i.e. built on stilts, stairs and vernacular Malay roof. Tanjong Jara Resort’s Serambi Seaview Rooms offer panoramic views of the South China Sea and the resort’s tropical gardens from a verandah. 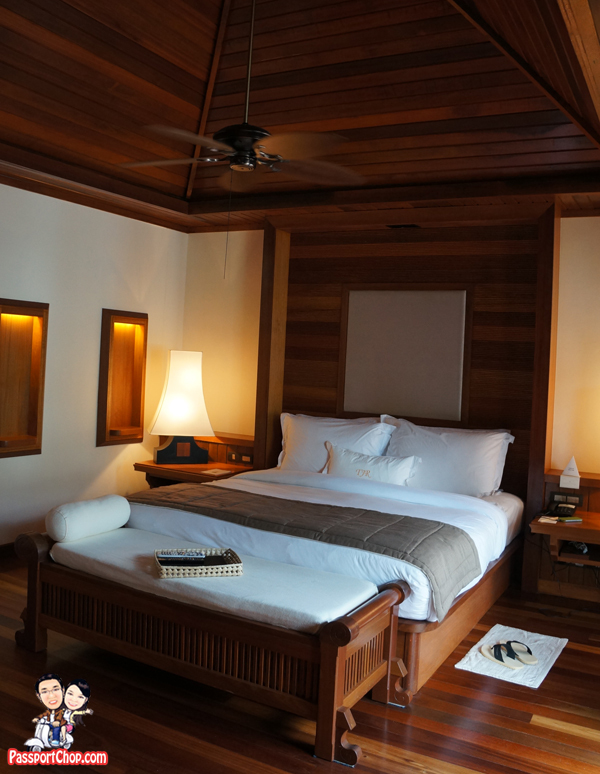 Just like a traditional Malay House, the interior of the Serambi Sea View rooms are partitioned to create smaller rooms such as serambi (verandah), living room, and bedroom. The “partitions” did not make the room seemed cramped at all and it is well thought-out with the wardrobe and luggage storage area well hidden along a long corridor (providing guests with a walk-in wardrobe “feel”) leading to the “living room” which comprised a day-bed and work desk. If you are staying at the top floor of the two-storey building, you will be able to see the vernacular Malay roof designed to provide ventilation for the hot and humid tropical climate. The roof is more for aesthetical purposes – to preserve the overall Malay architectural design; thankfully, the room is air-conditioned and there is also a ceiling fan in the room. The Serambi Seaview room itself is very spacious featuring a king-size bed, a smaller four poster day-bed, a flat-screen TV, mini bar, tea and coffee making facilities and a walk-in wardrobe. 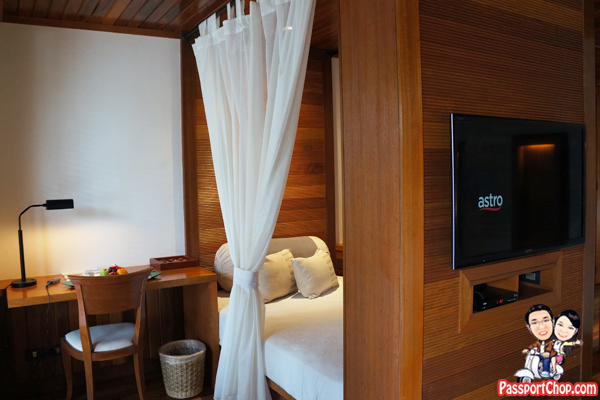 The day-bed is perfect for lazing around for an afternoon nap after a relaxing massage session at the Tanjong Jara Resort Spa Village! There are also Astro cable television channels available for the latest movies at HBO or documentaries at Discovery Channel. In-room Wi-Fi is available via a mobile broadband device – however, i think limited devices are available so do check with Tanjong Jara Resort over email on its availability and book one before leaving for your trip to the resort. 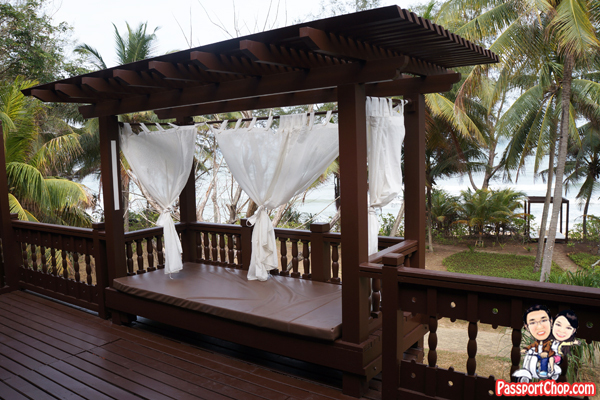 Mosquitoes can be a problem at Tanjong Jara Resort – unavoidable since the resort is itself located by the sea and within a large garden. There is a mosquito repellant device at the desk – do check with your butler on how to use it and remember to close the doors to the verandah. Each of these Serambi Seaview rooms feature a spacious en-suite indoor bathroom with his ‘n’ hers sinks, separate bathtub and walk-in rain shower facilities. There is a separate spacious make-up/cosmetic table with a large mirror and lots of bright lightings – perfect for the ladies (see picture below). 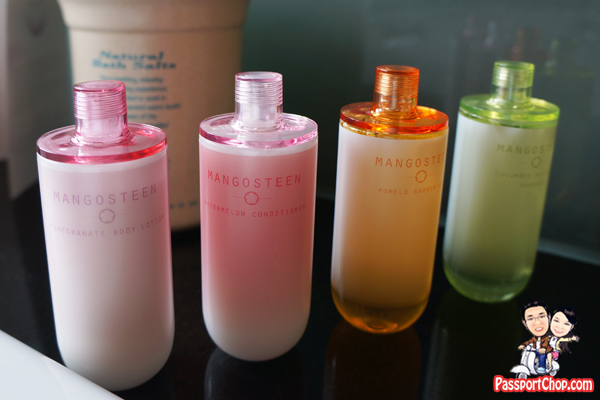 I don’t usually comment on toiletries but I thought that the toiletries used at Tanjong Jara Resort are worth a mention – they are from the Malaysian toiletry brand “Mangosteen“. The body lotion, conditioner, shampoo and body wash carry different tropical fruits smell from watermelon to pomelo and we found them very soothing, calming and revitalising. 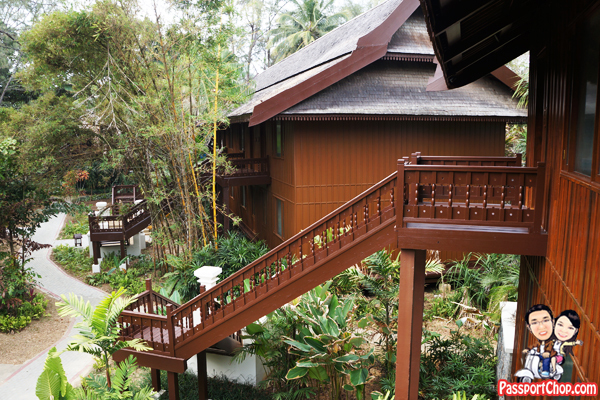 Of course with the room being called – the Serambi Seaview – how can we not feature the balcony/verandah (serambi loosely translated in Malay means “Balcony”!) that offers a panoramic view of the South China Sea. The balcony is very spacious, offering a perfect spot to enjoy a morning coffee while enjoying the sea breeze. 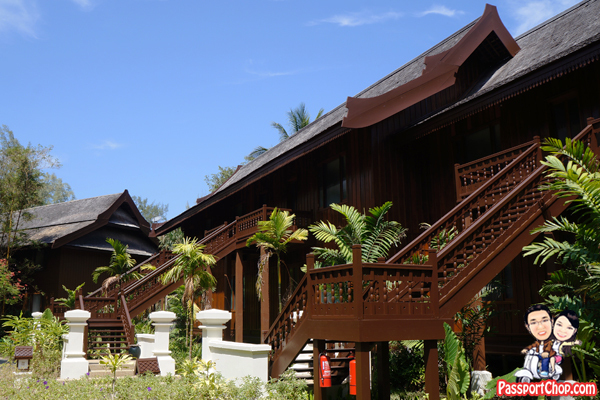 It also overlooks the gardens and beach of Tanjong Jara Resort. Just remember to close the doors linking the room to the verandah lest mosquitoes get into your room. 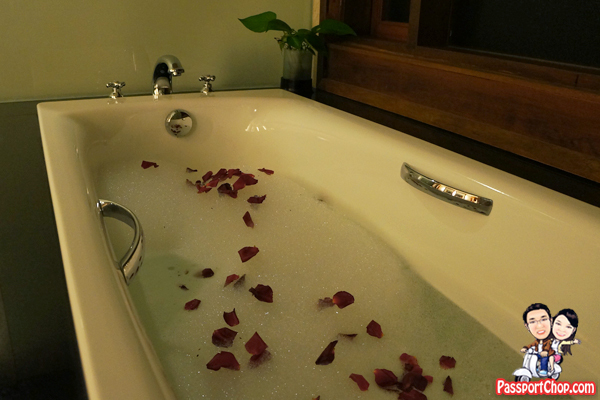 We stayed at the Tanjong Jara Resort during the tail end of the monsoon season. You can expect quite strong waves and in fact during our stay, most days are marked “red” – strong currents and swimming in the sea was not encouraged. For the same reason, sea sports e.g. diving and snorkelling were not in season. That was a pity as the resort is just a mere 50-minute speedboat ride away from one of the region’s best kept diving secrets, Tenggol Island. The untouched Tenggol in Terengganu Marine Park provides access to over 20 stunning diving and snorkelling sites. Tanjong Jara Resort offers the Tenggol Divers’ Delight experience for guests looking to explore the teeming marine world in the Terengganu Marine Park. This includes two daily dive excursions at Tenggol Island over two days and rental of dive equipment, sumptuous barbecue lunches on the beach, as well as daily breakfast and dinner at the resort. 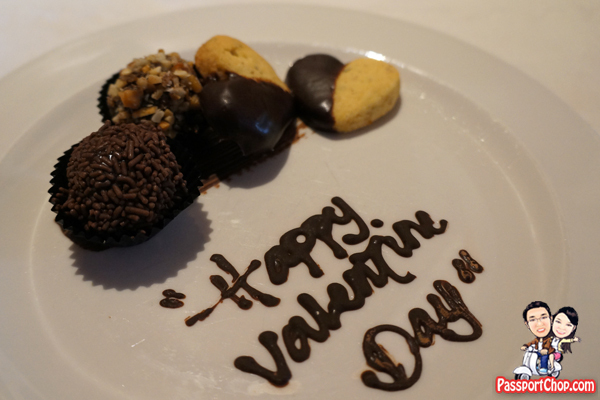 Available for booking from 1 March 2014 till October 28 2014, at a minimum of three nights’, based on twin-sharing accommodation, rates for this package begin at MYR1540++ per room per night. 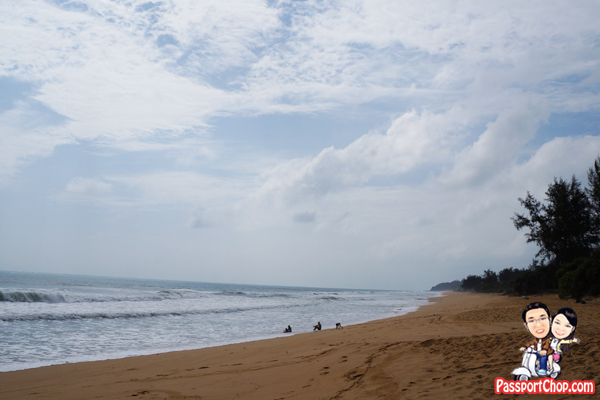 A major plus for visiting Tanjong Jara Resort during off-peak season is that it is less crowded and considering the spaciousness of the resort, you can almost have the feeling of having the resort and beach all to yourself! 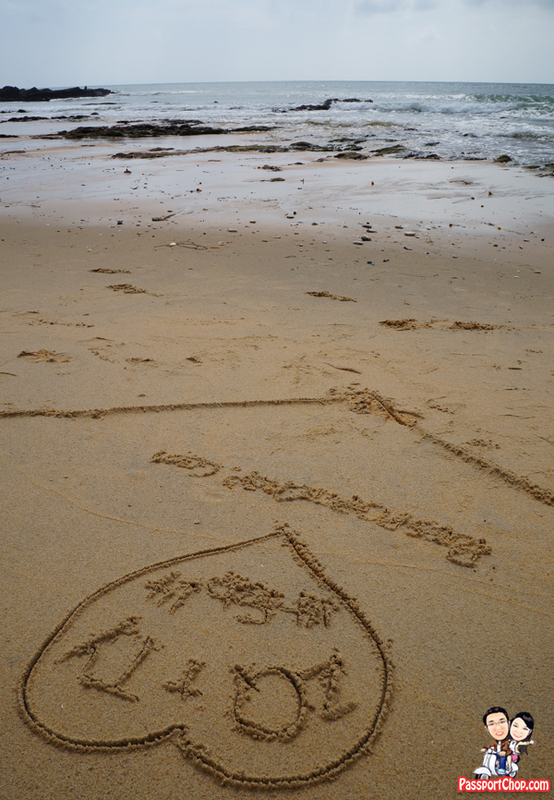 Despite the monsoon season, we enjoyed clear skies during most of the day; it rains a lot at night (typically after midnight) so the hypnotic rhythm of the falling rain plus sounds of waves makes for a very blissful slumber all the way to daybreak! I like the fact that Tanjong Jara Resort had not acquired this beach and fenced it off as a private beach as this would have been unfair to the locals – even then you won’t find the beach crowded with locals perhaps because the Terengganu coastline offers a lot of such beaches! 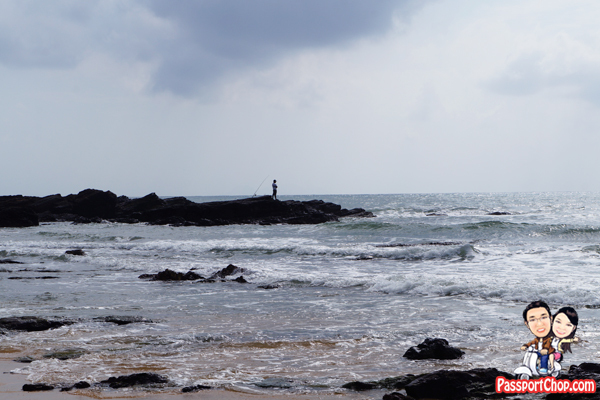 You will, however, find locals fishing in the choppy waters near the rocks. What you can expect at the beach at Tanjong Jara Resort is an unspoiled stretch of golden sand and (perhaps due to the monsoon season) almost no one on it – you can take long strolls along the beach and enjoy the sea breeze without being disturbed by touts or loud tourists – annoyances you would expect from such beautiful beaches. 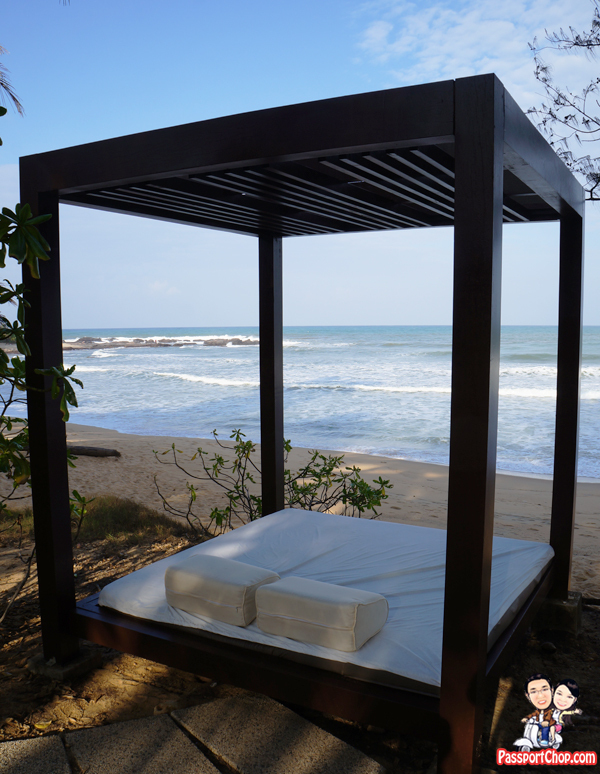 If you are feeling tired after a walk along the beach, just pop into one of the many unoccupied beach cabanas and take an afternoon nap – remember to apply your sunblock before you do that though. 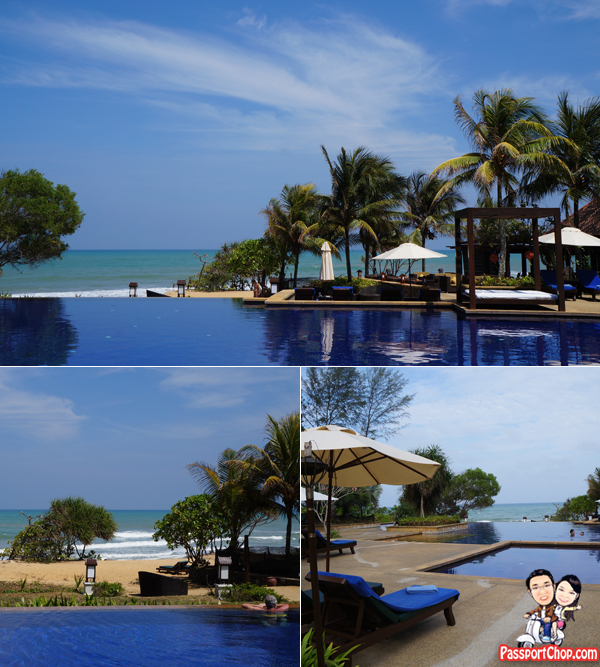 There are 2 swimming pools at Tanjong Jara Resort – i prefer the one nearer Nelayan restaurant; lots of outdoor sun beds and an inviting infinity pool that overlooks the beach and the South China Sea. Besides chilling out by the pool and taking walks along the beach, you can also sign up for the many activities organised by the resort which include a half-day cruise to Marang River to partake of the beauty of nature and wildlife or a visit to a Malay village or embarking on an exhilarating hike through the adventurous trail of a lush jungle to the base of the 200-metre Chemerung Waterfall. It is also possible to watch the famous Terengganu Green Turtles return to lay their eggs by joining excursions to nearby beaches during turtle-watching season. You can also participate in a bicycle tour to a local fishing village, meeting the locals, enjoying kopi kampong (local coffee) and snacks are popular with visitors. We will share more on our experiences with these activities in the next few posts. Even without stepping out of the resort, you can find curious sights around the resort gardens e.g. monitor lizards and macaques roaming the grounds. • Nearest airport is the Sultan Mahmud Airport in Kuala Terengganu. Car transfer from the airport to the Resort would take approximately 75 minutes. • Malaysia Airlines and Firefly flies direct from Kuala Lumpur to Kuala Terengganu in Malaysia. At the Kuala Terengganu airport, you can hire a taxi to go to Tanjong Jara Resort; buy a taxi coupon from the fixed price taxi counter (it will cost about RM 120 (per taxi) to get to Tanjong Jara Resort). Car transfer from the Kuantan Sultan Ahmad Shah airport to the Resort would take approximately 2 hours 30 minutes. Exclusively for residents of Malaysia, Singapore & Brunei, including its expatriates – residents can enjoy an all-inclusive package price which includes accommodation and dining at Tanjong Jara Resort. Check http://www.tanjongjararesort.com/packages/residents_package.htm for more info and the exact package price. Looks like a gorgeous place! It’s too bad there’s a lot of mosquitoes there. They can really ruin the experience. we took the airport transfer offered by the hotel – you will need to pay extra. Can anyone please tell me what the weather is like there in january as i’m planning to go in january 2017.